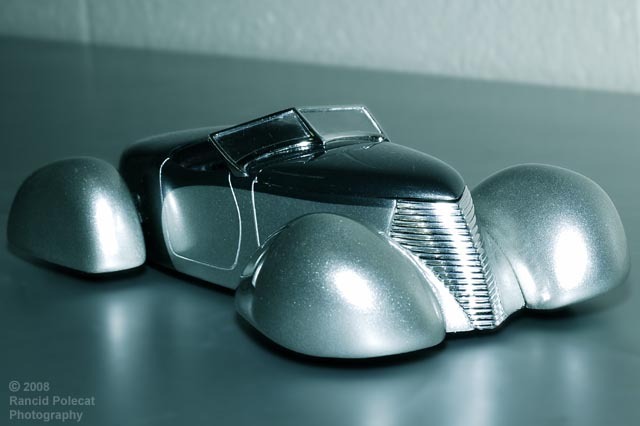 Bill Stillwagon's Art Deco roadster looks as if it popping from the pages of a 1940's comic book! This is what happens when you blend a Pyro Auburn Speedster with an AMT Phantom Vicky windsheild, a narrowed Testors Vantastic hood, a Smoothster grille, and some plastic spoons. Yes, plastic spoons. That's what Bill used to enclose the Auburn front pontoon fenders after extending them. The rear fenders are also extended and filled Auburn units.